I was asked by a number of people in my neighborhood to post this recipe after an event last week, so here it is in all its simplistic glory! 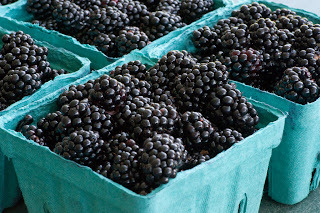 This is the best and freshest summer drink! Best part...its SOO easy! 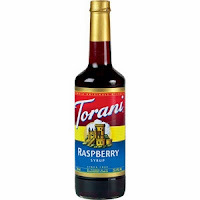 Dump grapefruit soda and blackberries into your pitcher or beverage holder, add in raspberry syrup- approximately 1/3 cup ( I love me some raspberry syrup so I use lots ), stir this in and sample, add more as desired. 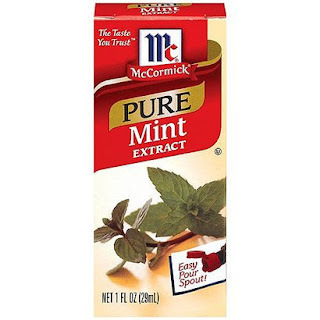 Finish by adding mint extract- do not use peppermint unless you want your drink to taste like a Christmas beverage gone bad~ I use just a splash or two (maybe 1-2 tsp). If you're using mint leaves, which is also good, place those in your pitcher first (about a handful of leaves), then press and grind them with a wooden press or spoon- you're just smashing out the oils- then add the rest of the ingredients. once everything is added- dump a bunch of ice in. 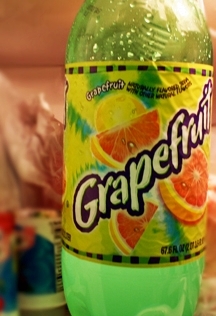 I used about two handfuls, this drink is better the colder it is. **Important step** let sit for about 20-30 minutes before serving to get it nice and cold!!! 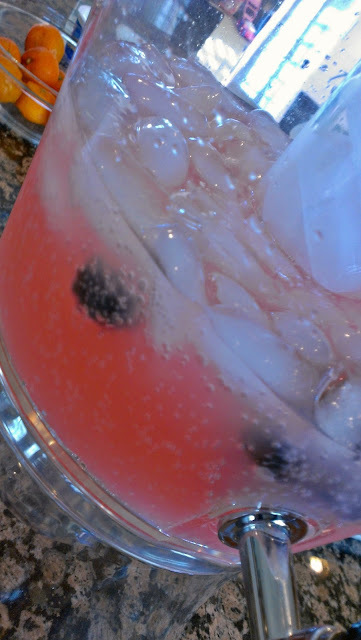 To add some fun color to this drink you can also freeze a few berries in ice cube trays with the raspberry syrup before hand and place those in every one's glasses!! 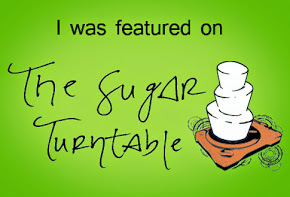 I'm am soooo excited to be featured as a guest blog by Kathryn of The Sugar Turntable! I was thrilled when she asked me to provide a tutorial for the fun Spring Tulip Cake Pops I did recently, and now you can enjoy it on her blog, here. Enjoy!!! 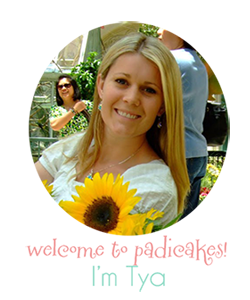 I was so thrilled when Kathryn asked if I’d be willing to do a tutorial on my spring tulip cake pops for the Sugar Turn Table blog! What can I say, I love her cute site and can easily spend hours reading tutorials and tips on things I even have no intention of making. There are just so many fun things to see!! Hopefully you can add this to your list of fun things to lose yourself in! I’ve seen these off and on around the internet. I can’t remember the site where I saw the tulip versions, but they are similar other floral cake pops I’ve made using modeling chocolate in the past. Once you make these, you’ll be able to play around with other flower cutters and make other flower pops as well. There are so many different variations out there to create! 1. To begin, start by making a batch of cake pops in any flavor you like. I love cake pops for that very reason! I love trying the new flavor combinations and mixing up strange things I might never pair with a cake. Mmmm, the thoughts make me drool! It’s a great activity to do with kiddies as well. My daughter’s great desire to make a mess translates perfectly into the process of breaking up cake into cake pop mix! If you’ve never had the chance to make cake pops, I base my recipes off the cake pop queen, Bakerellas recipe and instructions. You can make them with box cake mix and tub frosting, or your own recipes. I’ve used both with great success. 2. Once you’re ready to roll the pops, instead of rolling them into a ball shape, use the edge of your hands to mold it into a cone. This is the perfect shape for you tulip bulb. Place the sheet of bulbs into the fridge for 20 minutes or so to firm up. Pour onto plastic wrap and wrap tight. Let sit about 45-60 minutes until it is firm. Jessica Harris also has a video on how to make modeling chocolate on her super cute blog, jessicakes. 4. Once your pops are firm, you can take them out of fridge and let them sit while you melt some chocolate or candy melts in any color. You’ll take your lollipop sticks and dip them about a half an inch into the chocolate then insert them into the bottom of the cake pops. Then place the stick and pop into a sheet of Styrofoam so that it is standing up. After that, back into the fridge for another 20-30 minutes for the chocolate to harden. Then you will do the same thing, but this time dip the entire pop into your chocolate and gently shake off the excess, and return to fridge once more for 20 minutes. Now we’re ready to start the flowers!! This seems like a long process, but stick with me, the results in the end are well worth the wait-and the calories! 5. By now you’re modeling chocolate should be firm. Knead and knead it until it is soft and flexible and easily rolled out. Make sure there are no chunks of unmelted chocolate, if there are- just knead them out. Roll out the chocolate on the Silpat, or any non-stick mat you may have. If it is sticking to your rolling pin or mat you can sprinkle a very tiny bit of corn starch on it, but don’t use too much- it can change the texture of your chocolate. You want it to be thin, but not thin enough that you can see the color of your counter underneath. You don’t want to roll modeling chocolate as thin as you would gumpaste, as it tends to dry out a little too much and crack. You can cut these flowers with the three sided tulip cutter I show here, or a plain circle cutter. The three sided cutter is MUCH easier and faster, but it is possible to do it with the round as well. If you use a round, make sure you cut 5-6 petals for each flower you are doing. If you have the three sided, you’ll need to cut 2 for every flower. 7. While I’m cutting and shaping all my petals I like to keep them under plastic or a mat, just to keep them from firming up too much, but I also only do about 10 flowers at a time. If the chocolate sits out too long, it will start to firm. 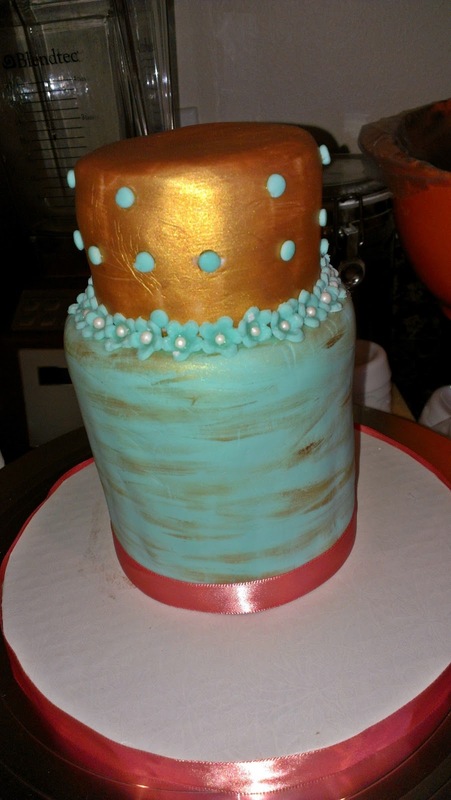 But, as opposed to gumpaste or fondant, if it firms up too much- just roll it back up and do it again! 8. Once you have all your petals cut, you can use the impression mats to give the petals their texture. I have also done flower pops with no texture and they are still cute as a button! 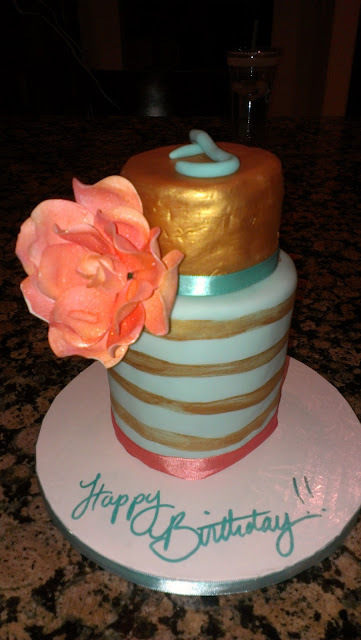 If you don’t have an impression mat, don’t shy away, with the colors, chocolate and cake- can you really go wrong?! Place your petals one by one onto your impression mat and press the palm of your hand just hard enough onto the edges of the petals for the mat to leave the marks. If you press to hard, your petal will stick and be a pain to get off. If your petals are particularly sticky, you can put a little corn starch on your palms so your petals don’t stick to you. Do this to all the petals. 9. Now that your petals are cut, molded and imprinted you can begin assembling them! Melt a little more chocolate, in the color of the petal you are working with. Place all your petals imprinted side down, so that you are only seeing the unprinted sides. You will then put a little chocolate in the centers and on the petals close to where they meet the center. You can use toothpicks or a small spatula or paintbrush to do this. You will now take your other flower cutting and lay it, imprinted side down, on top of this flower but rotated a quarter of the way so that the petals fit into the empty spaces of this flower. If you are using the round cutter, its the same idea. Just need to put the melted chocolate on the sides of each petal to “glue” them to each other in a tight circle. 10. Now that all the flowers are “glued” together you can shape them into the tulip. Yes this is a Styrofoam egg carton, but you don’t have to worry about the fact that it held mounds of bacteria previously on your eggs and will now be all over your tulip pops. I guess I’m probably the last to realize this, but these are dishwasher safe! I just put them on the top rack of my dishwasher, and Voila! Germ free flower formers! Repeat this process with all your petals and let them rest for 10-15 minutes. If you will need to let them sit longer, cover them with plastic wrap fairly tight so they don’t harden too much. 11. Let’s get this yummy goodness assembled!! After your tulip petals have set for a little bit, you can take a cake pop and paint melted chocolate around the bottom …. I find the best way to prevent breakage is to place your palm or fingers right underneath where you feel the stick coming through. Then you can brace the outside edges so they don’t break. Push the petals all the way up to the cake pop and use your palm to press the petals around the base where the melted chocolate is. The warmth of your palm will soften the petals a bit so that you can mold it around the pop. Once it is secured around the cake pop, you can take your paint brush, dip it in the chocolate and, while holding the stick a little sideways, you can paint the inside edges of the petals to secure them to each other. Do this all the way around the flower until all the petals are secured. Some may not need it, so just go where it’s needed. You can wipe any excess showing off with your fingers and it will be smooth. One of the many reasons I SOOO love working with modeling chocolate! 12. The fun thing about “gluing” your flower is you can use the placement of the glue to control whether you have a bloomed flower or more of a bud. The higher up you “glue” your petals, the more of a closed look your flower will have. The lower you glue, the more bloomed it will be. Don’t worry if you have cornstarch on your petals, it’s easy to get off at the end with a dry paintbrush, a little shortening on your fingers or you can brush luster dust on them. All look great! 13. Once you have completed assembling all your petals to pops, you can start your leaves… Pause for a snack first- but don’t worry- you’re in the home stretch!! Knead and soften your green modeling chocolate, roll it out and cut your petals. I cut these slightly thinner than the petals, but they look fine if you keep them the same thickness as well. You are going to take your sharp knife and cut off the top ½ inch of the thinnest curved pointy end. This is where it will wrap around the stick. 14. You will now place it on your veining mat, if you’re using one. I really like the cornhusk one for stems. It is listed in the supplies section. Press the leaves the same way you did the flower petals, gently but firmly on to the mat. So pretty! 15. Press the leaves the same way you did the flower petals, gently but firmly on to the mat. This part can seem tricky because the flower sticks are so skinny and the flowers are so top heavy, I just hold the stick in one hand and brace the flower and leaf with my other hand. Now gently wrap the bottom of the leaf around the stick, and softly pinch it together. You may need to hold it there a second while it dries a little. You can wipe any excess glue off with your finger for a smooth finish. 16. To anchor the tip of the leaf to the flower (so it doesn’t flop over and break), gently tilt the flower around to where the tip of the leaf touches the flower and note where the two touch. Put a little drop of melted chocolate there and softly press the leaf tip to the flower. Once it hardens a bit you can mold the leaf outward in a curl! At this point, Congrats!!! You’ve made your springy tulip cake pops!!! Sit back and stare lovingly at your hard work! They really are fun to hold and play with! You can leave them as they are, which looks great- or you can also add a few more fun little details. If you’d like to add pistil and stamens to your flower buds, they are a snap. Simply take some of your yellow modeling chocolate, barely any… mold it into a little triangle, and glue it onto the top of your bud with melted chocolate. Beautiful!!! Now for the little stamens, you just roll little bitty pieces into ovals and glue them on in a pattern of 3-4 around each pistil. Some other fun things I’ve used for the stamens if you don’t want to use the modeling chocolate, and want to give the flowers some more color, I’ve used things like chocolate covered sunflower seeds… I’ve used orange Tic-Tacs as well. Use your imagination; you can have so much fun with these! Or deliver to your lucky loved ones!! Is anything more springy and fun than these? 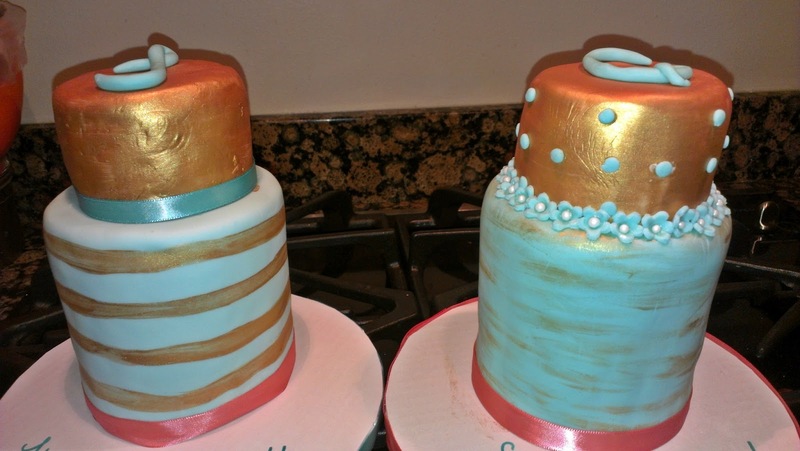 I love the bright colors and better yet- the fact that they're cake and modeling chocolate, can't be beat! My daughter and I decided to make these to deliver to our friends and family as a little spring/ Easter treat instead of cut flowers, we had so much fun seeing everyone's reaction, and it was even more fun watching my little one deliver them. They are chocolate cake pops with lemon frosting, covered in white modeling chocolate colored pink and yellow! Don't be overwhelmed, they are so much easier than they look!